By the time of the First World War it was becoming clear that the Fiveways Hospital was too small for its purpose. 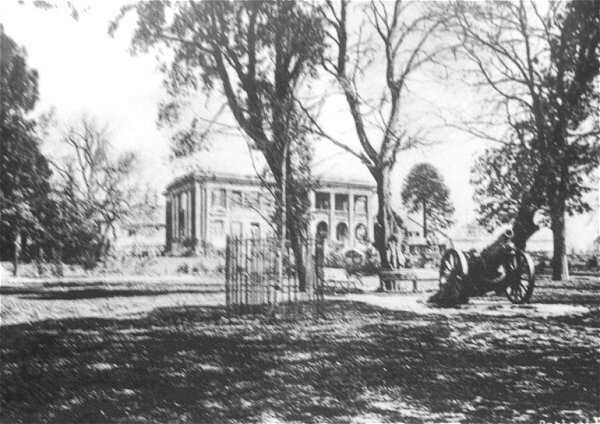 In 1916 the hospital trustees purchased Kingston Manor, from the estate of Thomas Dampier-Bide, together with its extensive grounds known as Bide's Gardens, with the intention of building a new larger hospital. 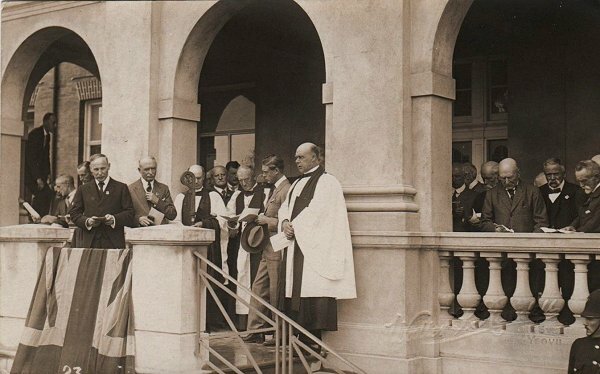 Because of the war, building on the new hospital site did not begin until 1921, the foundation stone being laid in June of that year. 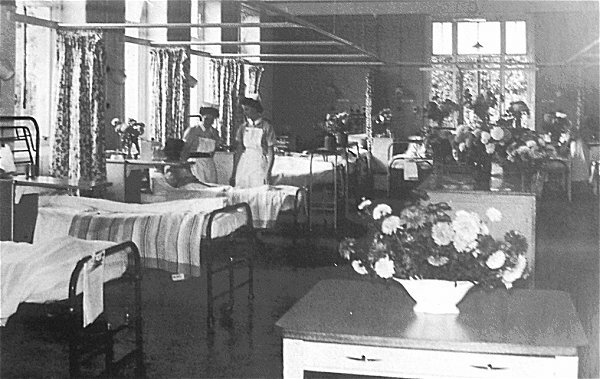 The hospital was designed by Mr Paul Waterhouse and featured electrical lighting and full central heating throughout. The building, with its entrance in Higher Kingston, cost over £20,000 (about £3,500,000 at today's value) to build. 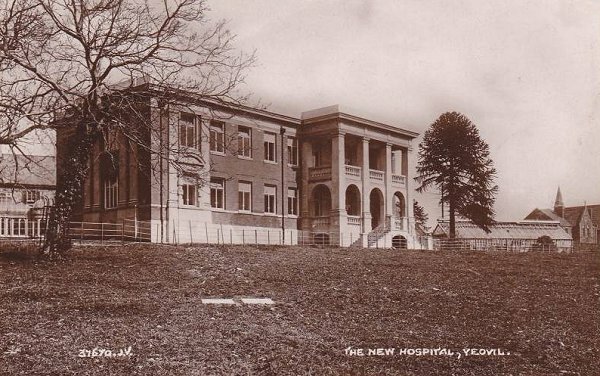 The new hospital opened, and the first patients were admitted, on 16 December 1922. 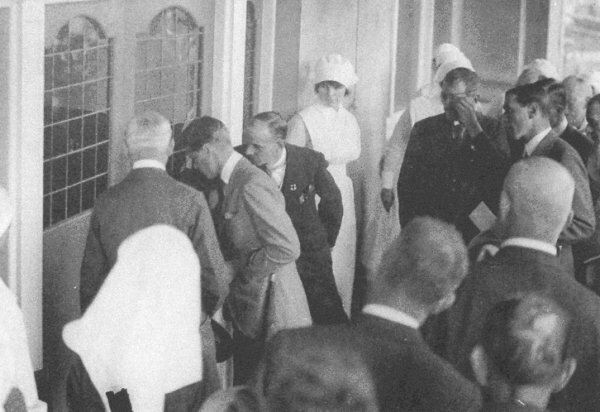 The new hospital was officially opened on 19 July 1923 by HRH the Prince of Wales, later Edward VIII. It was always the intention, as indicated in a photograph below, that another wing would be added at a later date in order to provide further accommodation. This had become necessary by the mid-1930s when it was decided to build a larger men's ward plus a children's ward. The new wing was designed by local architects Petter, Warren & Roydon Cooper and was completed by October 1947 at a cost of £11,810 (just under £2 million at today's value). Kingston Manor itself was later used as a nursing home with accommodation for private patients on the first floor and the dining room taking up much of the ground floor. 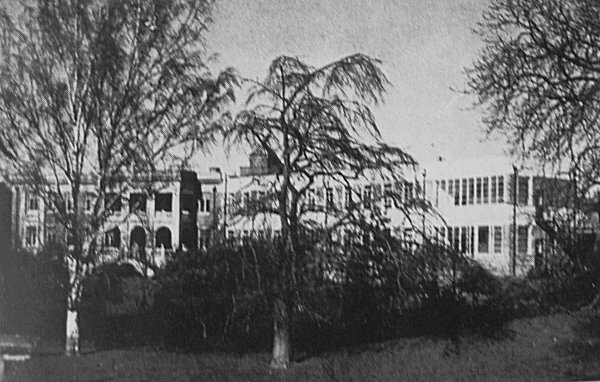 Holcote House in Mudford Road, now part of Yeovil College campus, was used as a Nurse Training School in conjunction with the Yeovil General Hospital. 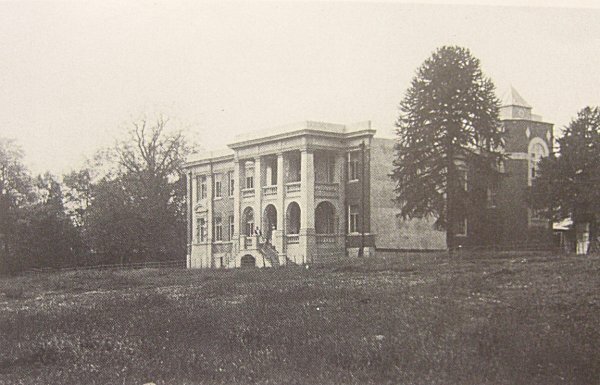 It had four acres of vegetable gardens which helped to supplement the diet of hospital patients. Ultimately, by the 1960s, the hospital was proving to be inadequate to meet the modern demands of the growing town. It was finally replaced by the new Yeovil District Hospital in 1973 and its site is now the hospital car park. 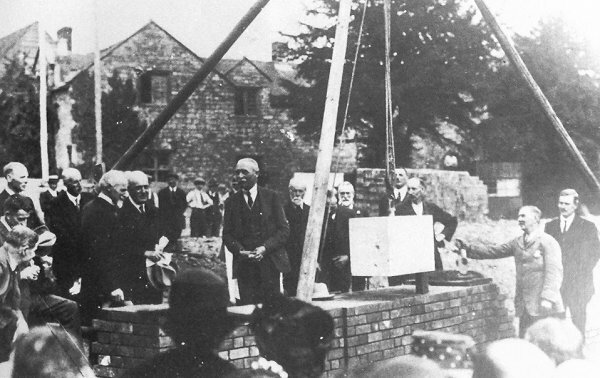 The laying of the foundation stone of the new hospital in June 1921 by the hospital's President, Colonel GCW Henage. 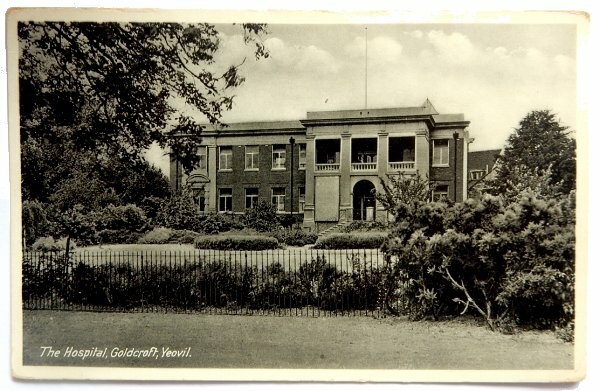 A postcard from the 1920s, before the new wing was added. Note the address 'Goldcroft'. 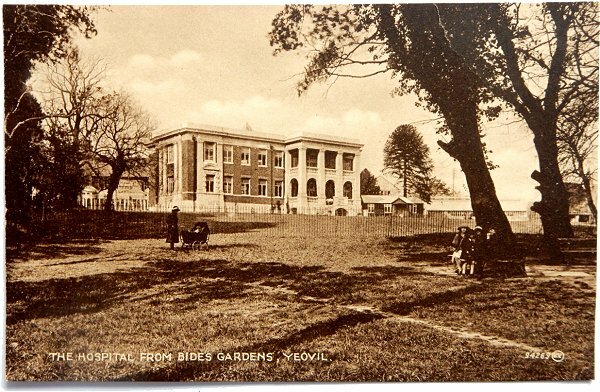 Another postcard from the 1920s (postmarked June 1930), showing the new hospital as seen from Bide's Gardens. Another postcard from the early 1930s (postmarked September 1934), showing the new hospital as seen from Bide's Gardens. Note the Great War howitzer at bottom centre. 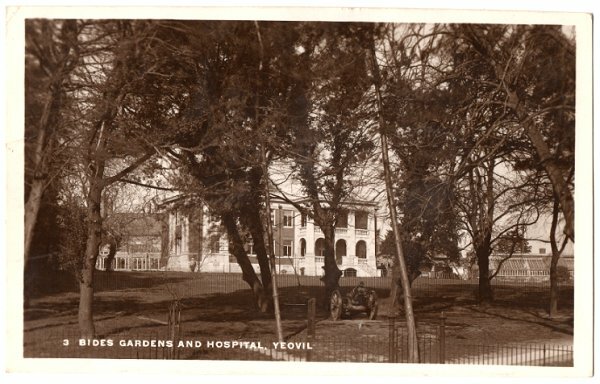 This photograph, taken during the later 1920s, looks across Bide's Gardens to the new Yeovil General Hospital. In the foreground is the famous artillery piece. 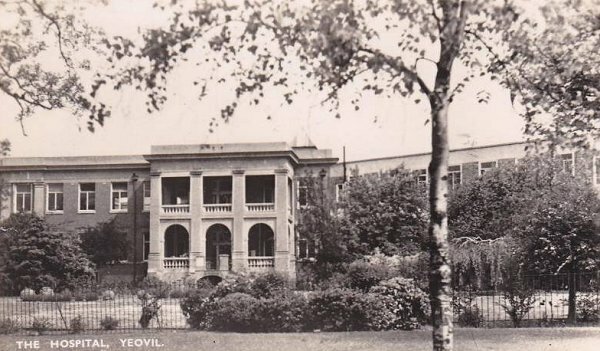 A closer view of the new Yeovil General Hospital, again taken during the late 1920s. 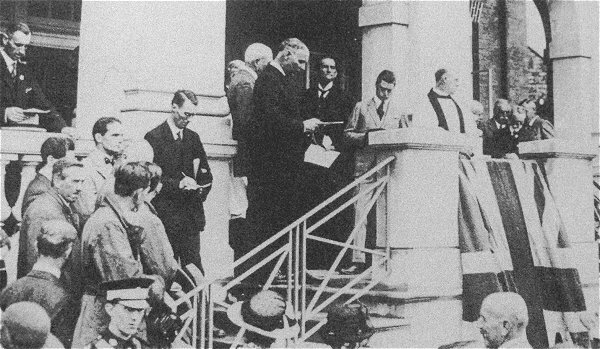 The new hospital was officially opened on 19 July 1923 by HRH the Prince of Wales, later Edward VIII, who is seen at centre just about to climb the steps. The following few photographs of the occasion were taken by Yeovil photographer Walter Rendell. HRH the Prince of Wales prepares to make his speech. 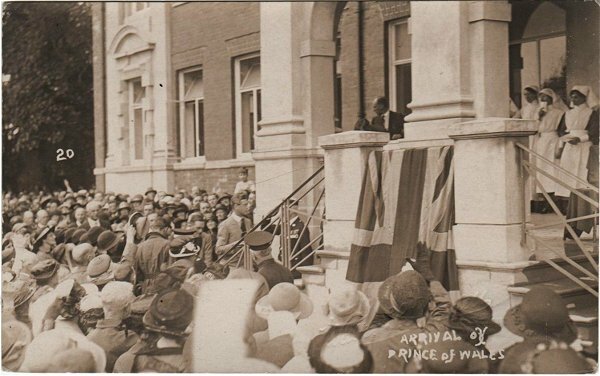 The new wing to the hospital was opened in 1923 by HRH the Prince of Wales, later Edward VIII. The doors of Yeovil General Hospital are ceremoniously opened by HRH the Prince of Wales. 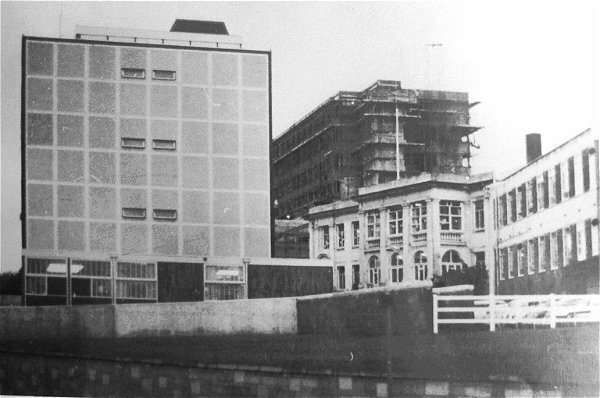 Seen from the southeast, the blank side wall half-hidden by the tree was a clear indication that an extension to the new hospital was intended from its inception. The new wing, completed. Photographed in the 1940s. .... and a more frontal view although the new extension is somewhat obscured. The Medical and Nursing Staff of the new Yeovil General Hospital in 1932. 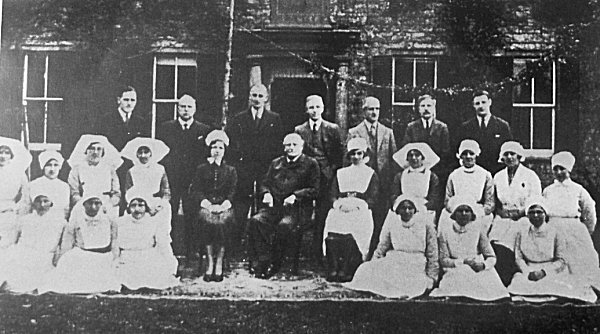 At centre are the Matron, Miss Ruth Anderson, and Dr Charles Marsh who worked at the hospital from 1880 until 1926, rising to become Senior Consulting Surgeon. 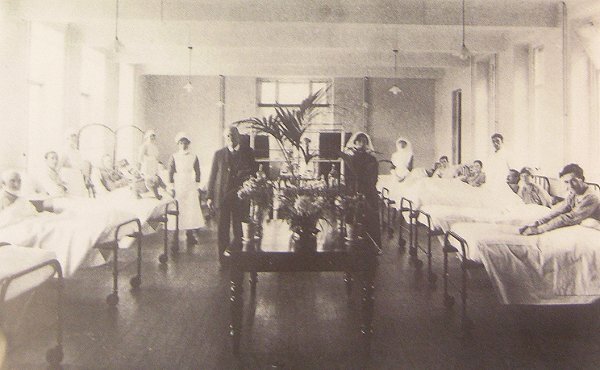 A photograph of the men's ward in the new wing shortly after it opened in 1923. 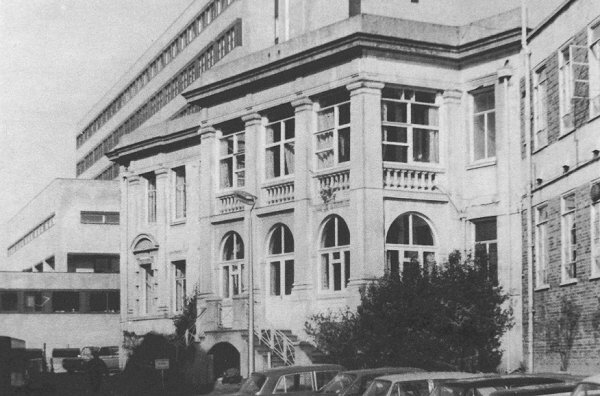 The women's ward, photographed in 1960. 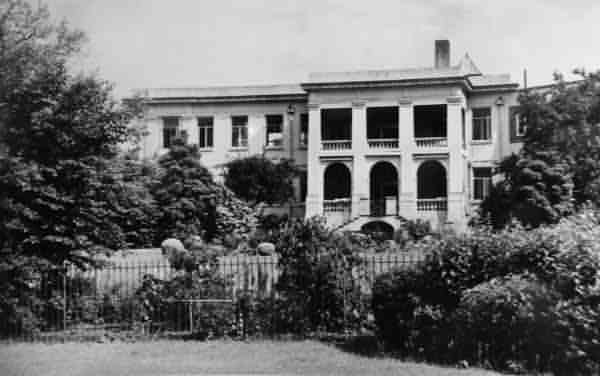 The hospital photographed from Bide's Gardens in the 1950s by HA 'Jack' Cooper. 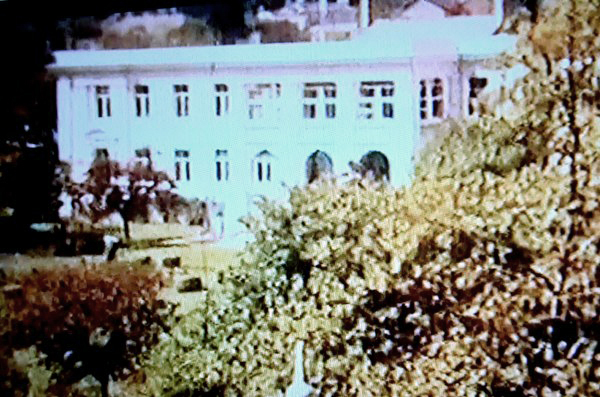 A still taken from a home movie of around 1962 showing the hospital, seen across Bides Gardens from the top of the Odeon Cinema. 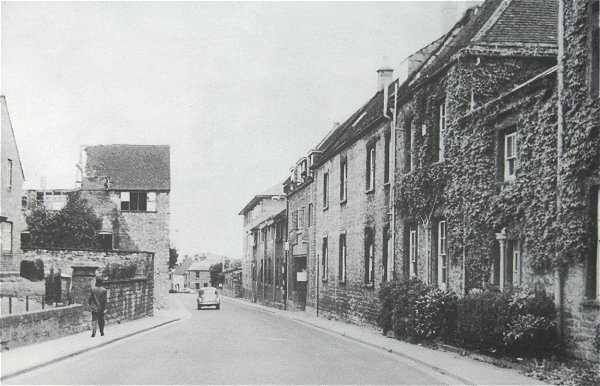 Looking east along Higher Kingston around 1965, Yeovil General Hospital is on the right. At left the old glove factory is being demolished. 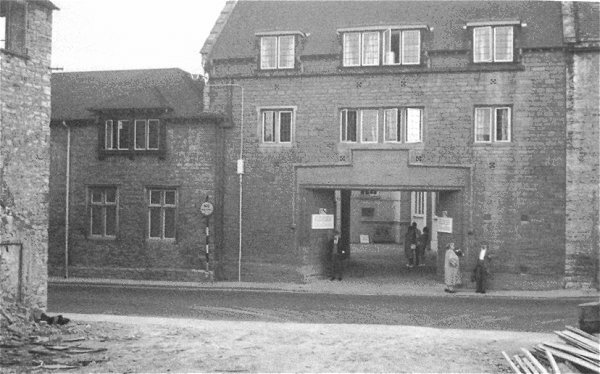 The entrance to Yeovil General Hospital in Higher Kingston, seen from the yard of the old glove factory being dismantled in the photograph above. The photographer would have been standing on the site of the former Kingston Pitney Chapel. The inscribed stonework above the porte cochere, or archway, was preserved in the wall of the present car park but, alas, has now been removed and broken up (see next photo). 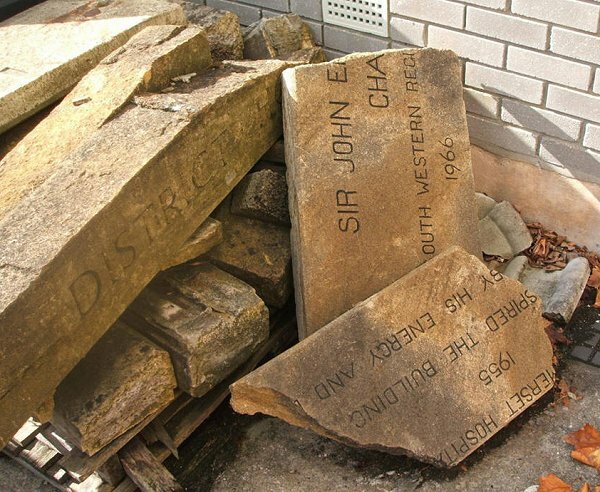 The stonework referred to in the previous photograph - a small piece of Yeovil's history, here seen ignominiously broken up and dumped. Photographed around 2010. 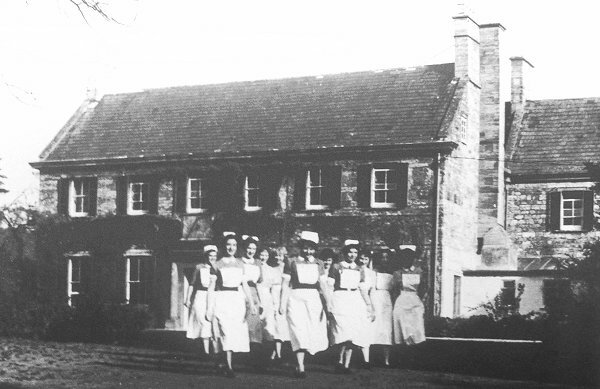 Nurses outside Kingston Manor around 1960. At this time the old manor house was being used as a nursing home. Photographed shortly before demolition, the old Yeovil General Hospital is seen against the new Yeovil District Hospital. The old Yeovil General Hospital, at right, is completely dwarfed by the new maternity unit of the District Hospital at left. The main block of the new District Hospital is under construction in the background. 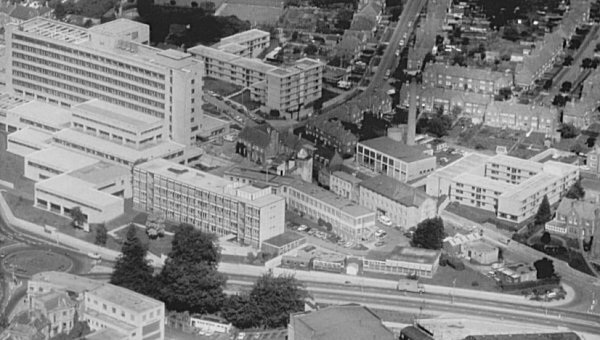 In an aerial photograph of about 1972 the old Yeovil General Hospital building at centre, partially hidden by the new maternity unit, is dwarfed by the new Yeovil District Hospital complex. 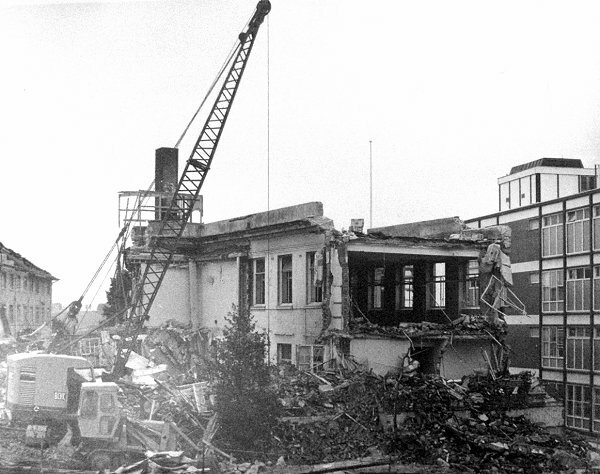 Demolition of the old hospital, circa 1973.